It’s funny now how when I was growing up Vampires and Werewolves and such creatures were the subjects of cheesy old black and white movies that nobody took seriously. It would have been hard to imagine back then that the future would have multiple blockbuster films involving them. I wonder what stuff seems silly now that will be huge in the future. LOL cats? I can see it now… LOLCats… The Movie! Lemme guess, classic monster week? Conversely, I can see disaster movies becoming cheesy and silly in the future. Twitter and Google Wave as well. I predict that Zombies will always be considered awesome when done properly. @PTTG: I was just thinking that. Seriously, he’s the only live “being” in Biff World, besides perhaps his toaster. How I wish to insert a lol cat image into my text…oh well. @dartigen: I think disaster movies are pretty rediculous right now, and I don’t see them becoming a huge success, they generally have a terribly repetitive arc. Not really. Anybody remember the books about Bunnicula? Vampire rabbit used his fangs on all the veggies! I can has yur orginz? Wait. Is Twilight going to be even SILLIER in the future? I do! I remember Bunnicula! I wish they had made a movie about him. Those books were much better than Twilight. Seriously, Edward gets stomped by a vampire bunny. It’s pathetic. Count Duckula was so cool. I remember watching it a long time ago, and I still think it’s great. All the classic monster cliches were there to be made fun of, and that’s what made it such a clever parody. @Madness; You’re forgetting the Gungerlock. @Biff; Furbies. Definately Furbies. They’ll terrorize the world, and everyone will curse our generation for summoning them. I LOVE Bunnicula ^^ I have several of those books at my house!! Holy crud is this veggie day? I’ve read 5 vegetarian webcomics comics today! @DTanza: Yeah, this is crazy. I’ve read a Facepunch thread, the SMBC comic, and now BIFF! Can you link the comics you’ve read? The return of Biff’s roommate. From beyond the grave!! A vampire can be quite dangerous to Biff..If he had no blood to sell, he would be without money. @MaskedMan: I thought Furbies were already tied to Gremlins. Unintentionally, (so the corporation says,) but still connected. Now if Biff was drinking tomato juice, he would have something to worry about. I don’t think soy milk would be very tasty to any vampire. @LazerWulf: It would be hilarious to see an lolcats movie! Biff’s roommate is right there but you can’t see them in mirrors, photos or drawings. Everyone knows that. Vampire fyi. Soy provides about 10% of the nutrition that regular blood does. Tastes like crap but it will keep you going when the blood runs out. And I thought Biff only drank tea! The BEST cheesy vampire film is the 2008 Malaysian Film Festival, Winner- “Kala Malam Bulan Mengambang” or The Night of the Full Moon…black/white and wonderful, moments of laugh out loud funniness. Biff might want to check it out. Why did the vampire give up the vegetarian diet? He couldn’t get blood from a turnip. 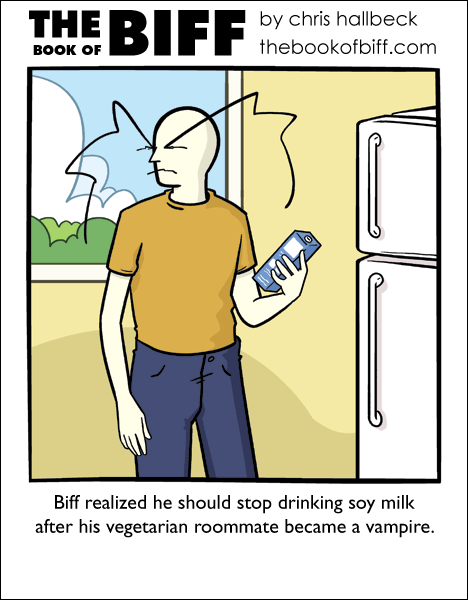 So, if vegetarian vampires drink soy milk… and Biff is worried about being bitten… does this mean Biff is made of tofu? I never really like vampires or werewolves, mainly because they were strange. I don’t understand the appeal. I hate Twilight mainly because I don’t understand the appeal of vampire or werewolves for that matter. What IS cheesy today? He-Man and other muscular barbarians, serious Orcs without the world of warcraft irony and the post-apocalyptic inner-city gangs. All the drop-dead serious cyberpunk from the 80’s. But first on my list: What with all the reality-shows and “so you think you can dance” that kids today grow up with, it’s only natural that in 10 years time we’ll have a remake of the movie “Fame”. I’m pretty sure those old black and white vampire movies were very popular when they were the height of special effects for their time. and lolcat r serius biznis. Written by famed German producer Aiken Hahz, who brought you such tales as Ceiling Cat, The Passion of the Jesus Cat, and I’m in ur Base. Coming this summer, don’t miss it.